Online ticket sales ended, but tickets will still be available at the box office. 6pm for VIP tickets and 7pm for General Admission. 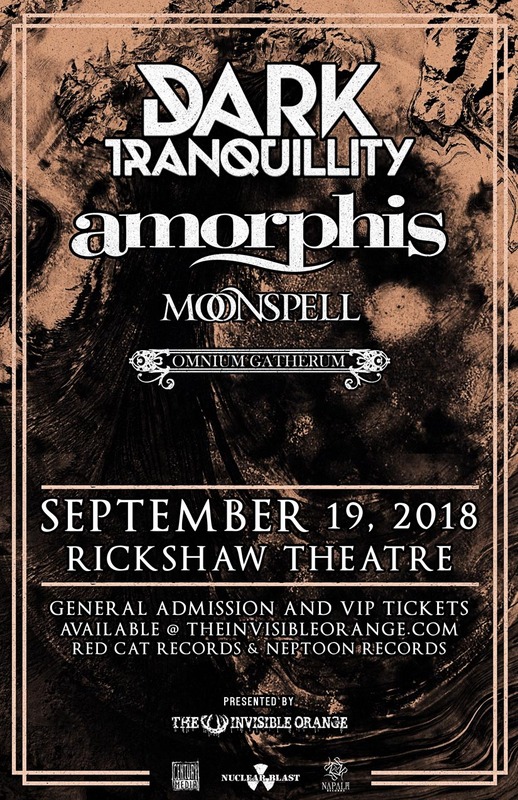 Melo-death pioneers DARK TRANQUILLITY from Gothenburg, Sweden will return to North America with a co-headlining trek with Melancholic progressive metallers AMORPHIS this September 19 at the Rickshaw Theatre. Joining them are Portugal's premiere gothic-metallic-force MOONSPELL, and Finnish melo-death contingent OMNIUM GATHERUM. VIP package includes early entry, show poster and meet and greet with ALL FOUR bands.